A supernova was observed by the Chinese and Amerindians as a star exploded in the constellation Taurus. 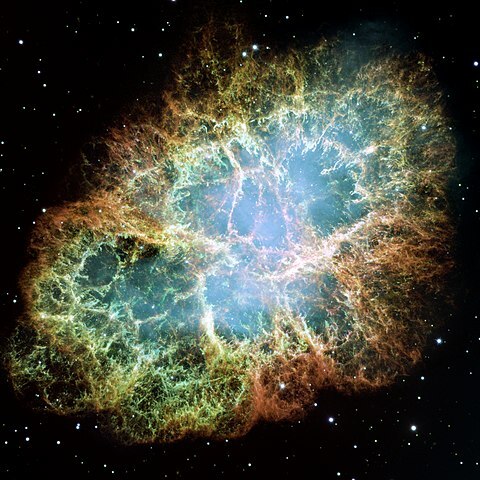 The explosion remained bright enough to be seen during daylight for several months, the remains are now visible as the Crab Nebula. William Herschel made his last recorded telescopic observation, of the 1819 comet. A. Borrelly discovered asteroid #369 Aeria. M. Wolf discovered asteroid #914 Palisana. Marie Curie (nee Sklodowska) (7 November 1867 - 4 July 1934) was born in Warsaw, Poland, to a family of teachers who believed strongly in education. She moved to Paris to continue her studies and there met Pierre Curie, who became both her husband and colleague in the field of radioactivity. The couple later shared the 1903 Nobel Prize in Physics with Henri Becquerel "in recognition of the extraordinary services they have rendered by their joint researches on the radiation phenomena discovered by Professor Henri Becquerel." Marie was widowed in 1906, but continued the couple's work and went on to become the first person ever to be awarded two Nobel Prizes, recipient of the 1911 Nobel Prize in Chemistry "in recognition of her services to the advancement of chemistry by the discovery of the elements radium and polonium, by the isolation of radium and the study of the nature and compounds of this remarkable element." During World War I, Curie organized mobile X-ray teams. 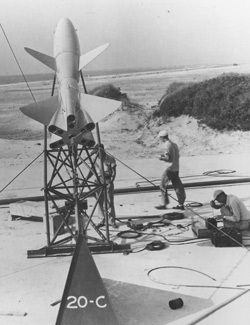 The first research rocket was launched from NASA's Wallops Island Station. The Tiamat missile was a two stage rocket which employed six booster rockets, had automatic stabilization, and pre-programmed maneuvers. Dr. William Shockley announced the invention of the junction transistor at Bell Labs, Murray Hill, New Jersey. NASA launched Explorer 38 (RAE 1, Radio Astronomy Explorer) from Cape Canaveral, Florida, to gather Earth, solar, and cosmic radio emission data. The RAE-1 spacecraft, launched 4 July 1968, measured the intensity of celestial radio sources, particularly the Sun, as a function of time, direction, and frequency (0.2 to 20 MHz). The spacecraft was gravity gradient oriented, weighed 193 kg, and had an average power consumption of 25 W. It carried two 750-ft-long V-antennas, one facing toward the Earth and one facing away. A 120-ft-long dipole antenna was oriented tangentially with respect to the Earth's surface. The spacecraft was also equipped with one 136-MHz telemetry turnstile. Onboard experiments consisted of four step-frequency Ryle-Vonberg radiometers operating from 0.45 to 9.18 MHz, two multichannel total power radiometers operating from 0.2 to 5.4 MHz, one step frequency V-antenna impedance probe operating from 0.24 to 7.86 MHz, and one dipole antenna capacitance probe operating from 0.25 to 2.2 MHz. RAE-1 was designed for a one year minimum operating lifetime, but the spacecraft tape recorder performance began to deteriorate after 2 months in orbit. In spite of several cases of instrument malfunction, good data were obtained on all three antenna systems. USSR Soyuz 14 docked with the Salyut 3 space station. Soyuz 14 was launched 3 July 1974 as a test of Salyut's engineering systems and energy supply. On 4 July, Soyuz 14 docked with the Salyut 3 space station after 15 revolutions of the Earth. The planned experimental program included manned military reconnaissance of the Earth's surface, assessing the fundamental value of such observations, and some supplemental medico-biological research. Soyuz 14 landed on 19 July 1974 following 15 days, 17 hours docked at Salyut 3. After the crew's return to Earth, research continued in development of the on-board systems and the principles of remote control of such a station. L. Chernykh discovered asteroid #3332. USSR Soyuz 30 touched down in Soviet Kazakhstan, returning from Salyut 6 (Salyut 6 EP-3, Salyut 6 EO-2). NASA's STS 4 (Columbia 4, 4th Shuttle mission) ended, completing the Department of Defense flight which also flew the Continuous Flow Electrophoresis System (CFES) experiment. The STS 4 launch on 27 June 1982 proceeded as scheduled with no delays. The two solid rocket booster casings were lost when their main parachutes failed and they impacted the Atlantic Ocean's water and sank. Some rainwater penetrated the protective coating of several tiles while the orbiter was on the pad. On orbit, the affected area was turned toward the Sun, which vaporized the water and prevented further tile damage from freezing water. STS 4 was the final Space Transportation System research and development (R&D) flight. In addition to a classified Department of Defense payload, the cargo included the first Get Away Specials, which contained nine experiments from Utah State University; the first commercial experiment involving the Continuous Flow Electrophoresis System (CFES); the Monodisperse Latex Reactor (MLR); the Induced Environment Contamination Monitor (IECM), which was deployed, and two Shuttle Student Involvement Program (SSIP) experiments. The crew took data for two medical experiments on themselves, operated the remote manipulator arm to swing IECM around the orbiter, and took photos of lightning activity in the Earth's atmosphere. STS 4 ended when Columbia landed on revolution 113 on Runway 22, Edwards Air Force Base, California, the first landing on the 15,000 foot long concrete runway. Rollout distance: 9,878 feet. Rollout time: 73 seconds. Launch weight: 241,664 pounds. Orbit altitude: 197 nautical miles. Orbit inclination: 28.5 degrees. Mission duration: seven days, one hour, nine minutes, 31 seconds. Miles Traveled: 2.9 million. The orbiter was returned to Kennedy Space Center on 15 July 1982. The flight crew for STS 4 was: Thomas K. Mattingly, Commander; Henry W. Hartsfield Jr., Pilot. USSR launched BOR-5 Flight 1 from Kapustin Yar, a suborbital test of a 1/8 scale model of the Buran spaceplane, with a typical trajectory of ascent to 120 km, from which it was pitched down to drive the model into the atmosphere at 45 degree at Mach 18.5. Per Lindstrand and Richard Branson became the first travelers to successfully cross the Atlantic Ocean in a hot-air balloon. Richard Branson and Per Lindstrand lifted off Thursday morning 3 July 1987 from a ski resort at Carrabassett Valley, Maine in the Virgin Atlantic Flyer, a hot air balloon approximately 21 stories tall. They covered the first 1,000 miles of their 3,400-mile journey in a little more than 10 hours, traveling far faster than expected with the aid of the jet stream. They broke the distance mark for hot-air balloons at 907 miles while passing about 140 miles southeast of St. John's, Newfoundland on the afternoon of 3 July. Their balloon got into trouble soon after it crossed the Irish coast. Low clouds forced the pair to bring the balloon down and seek a landing spot even though they believed the wind would have carried them to their goal, the Mull of Kintyre, a peninsula on the Scottish coast. After descending from 27,000 feet, they hit the ground near Limavady in Northern Ireland, scraping along the ground and losing two fuel tanks. Regaining altitude, the billowing black and silver craft proceeded east. But once over water again, it began bouncing along the sea near Rathlin Island, losing its flotation bags after an unsuccessful attempt to land on a beach on the island. The two adventurers jumped into the sea as the disabled balloon went down within sight of their landing target on the coast of western Scotland. They were pulled from the sea by Royal Navy rescue teams about 37 hours after they took off from Maine. Branson was quickly picked up by a helicopter, but Lindstrand, without a life vest, spent more than two hours swimming against strong currents in the cold water before he was found. USSR launched the Nadezhda 1 civilian maritime navigation satellite from Plesetsk, positioned in plane 11 of the constellation, which carried a COSPAS/SARSAT search and rescue package. The US Air Force launched Navstar 2A-02 (USA 71) from Cape Canaveral, Florida, a GPS Block 2A Global Positioning System satellite placed in Plane D Slot 1. The launch also carried Losat X (Low Altitude Satellite Experiment), a test flight of DoD sensors. NASA's STS 71 (Atlantis) undocked from the Russian Mir space station, completing the first joint Shuttle-Mir mission. STS 71 was originally targeted for launch in late May, but slipped into June to accommodate Russian space program activities necessary for the first Space Shuttle/Mir Space Station docking, including a series of spacewalks to reconfigure the station for docking, and launch of a new Spektr module to Mir containing US research hardware. The launch set for 23 June was scrubbed when rainy weather and lightning prevented loading of the external tank earlier that day. The second try on 24 June was scrubbed at the T-9 minute mark, again due to persistent stormy weather in central Florida, coupled with a short (10 minute) launch window. The liftoff was re-set for 27 June 1995, and the final countdown proceeded smoothly. STS 71 marked a number of historic achievements in human spaceflight history: the 100th US human space launch conducted from Cape Canaveral; the first US Space Shuttle-Russian Space Station Mir docking and joint on-orbit operations; the largest spacecraft ever in orbit; and the first on-orbit changeout of a Shuttle crew. Docking occurred on 29 June at 9 a.m. EDT, using an R-Bar (Earth radius vector) approach, with Atlantis closing in on Mir from directly below. The R-bar approach allows natural forces to brake the orbiter's approach more than would occur along a standard approach from directly in front of the space station. An R-bar approach also minimizes the number of orbiter jet firings needed for the approach. The manual phase of docking began with Atlantis about half a mile below Mir, with Gibson at the controls on the aft flight deck. Stationkeeping was performed when the orbiter was about 250 feet from Mir, pending approval from Russian and US flight directors to proceed. Gibson then maneuvered the orbiter to a point at about 30 feet from Mir before beginning the final approach to the station. The closing rate was near the targeted 0.1 feet per second, and the closing velocity was approximately 0.107 feet per second at contact. The interface contact was nearly flawless, with less than one inch of lateral misalignment, and an angular misalignment of less than 0.5 degrees per axis. Docking occurred about 216 nautical miles above Lake Baykal region of the Russian Federation. The Orbiter Docking System (ODS) with an Androgynous Peripheral Docking System served as the actual connection point to a similar interface on the docking port on Mir's Krystall module. The ODS was located in Atlantis' forward payload bay, and performed flawlessly during the docking sequence. When linked, Atlantis and Mir formed largest human spacecraft ever in orbit, with a total mass of almost one half million pounds (about 225 tons) orbiting some 218 nautical miles above the Earth. After hatches on each side opened, the STS 71 crew passed into Mir for a welcoming ceremony. On same day, the Mir 18 crew officially transferred responsibility for station to the Mir 19 crew, and two crews switched spacecraft. For next five days, about 100 hours total, joint US-Russian operations were conducted, including biomedical investigations, and transfer of equipment to and from Mir. Fifteen separate biomedical and scientific investigations were conducted, using the Spacelab module installed in the aft portion of Atlantis' payload bay, and covering seven different disciplines: cardiovascular and pulmonary functions; human metabolism; neuroscience; hygiene, sanitation and radiation; behavioral performance and biology; fundamental biology; and microgravity research. The Mir 18 crew served as test subjects for the investigations. The three Mir 18 crew members also carried out an intensive program of exercise and other measures to prepare for re-entry into the gravity environment of Earth after more than three months in space. Numerous medical samples, as well as disks and cassettes, were transferred to Atlantis from Mir, including more than 100 urine and saliva samples, about 30 blood samples, 20 surface samples, 12 air samples, several water samples and numerous breath samples taken from the Mir 18 crew members. Also moved into the orbiter was a broken Salyut-5 computer. Transferred to Mir were more than 1,000 pounds of water generated by the orbiter for waste system flushing and electrolysis; specially designed spacewalking tools for use by the Mir 19 crew during a spacewalk to repair a jammed solar array on the Spektr module; and oxygen and nitrogen from the Shuttle's environmental control system to raise the air pressure on the station, requested by the Russians to improve the Mir consumables margin. The two spacecraft undocked on 4 July, following a farewell ceremony, with the Mir hatch closing at 3:32 pm EDT on 3 July, and the hatch on the Orbiter Docking System being shut 16 minutes later. Gibson compared the separation sequence to a "cosmic" ballet: Prior to the Mir-Atlantis undocking, the Mir 19 crew temporarily abandoned the station, flying 100 meters away in their Soyuz (TM-21) spacecraft so they could record images of Atlantis and Mir separating. As Atlantis began its flyaround at a distance of 210 meters, Soyuz redocked with the Kvant module, about a minute early. Just prior to the redocking, one of Mir's attitude control computers crashed, putting Mir in free drift, although this was not considered a serious problem. At 12:35 GMT, Atlantis completed its 360 degree flyaround and ignited its engines for the separation burn, while sending back spectacular TV images of the Mir complex. After undocking from Mir, Atlantis spent several days on orbit, carrying out medical research work with the Spacelab-Mir module in the cargo bay. The returning crew of eight equaled the largest crew (STS 61-A, October 1985) in Shuttle history. To ease their re-entry into the gravity environment after more than 100 days in space, Mir 18 crew members Thagard, Dezhurov and Strekalov lay supine in custom made recumbent seats installed prior to landing in the orbiter middeck. Inflight problems included a glitch with General Purpose Computer 4 (GPC 4), which was declared failed when it did not synchronize with GPC 1. Subsequent troubleshooting indicated it was an isolated event, and GPC 4 operated satisfactorily for the remainder of mission. STS 71 ended on 7 July 1995 when Atlantis landed on revolution 153 on Runway 15, Kennedy Space Center, Florida. Rollout distance: 8,364 feet (2,549 meters). Rollout time: 51 seconds. Orbit altitude: 170 nautical miles. Orbit inclination: 51.6 degrees. Mission duration: nine days, 19 hours, 22 minutes, 17 seconds. Miles Traveled: 4.1 million. The runway was switched from 33 to 15 about 20 minutes before touchdown due to concerns of Chief Astronaut Robert Cabana, flying a Shuttle Training Aircraft, about clouds blocking the runway landing aids from view. After landing, President Clinton phoned congratulations to the crew for their successful mission, and extended an invitation to visit the White House. The flight crew for STS 71 was: Robert L. Gibson, Commander; Charles J. Precourt, Pilot; Ellen S. Baker, Mission Specialist; Bonnie J. Dunbar, Mission Specialist; Gregory J. Harbaugh, Mission Specialist; Anatoly Solovyev (returned in Soyuz TM-21); Nikolai Budarin (returned in Soyuz TM-21); Norman E. Thagard returned from Mir (launched on Soyuz TM-21); Vladimir Dezhurov returned from Mir (launched on Soyuz TM-21); Gennadiy Strekalov returned from Mir (launched on Soyuz TM-21). NASA's Mars Pathfinder spacecraft landed in the Ares Vallis region of Mars, the first US space probe to land on the planet in more than two decades, and returned images of surface. The spacecraft entered the Martian atmosphere on 4 July 1997 directly from its approach hyperbola at about 7300 m/s without going into orbit around the planet. The cruise stage was jettisoned 30 minutes before atmospheric entry. The lander took atmospheric measurements as it descended. The entry vehicle's heat shield slowed the craft to 400 m/s in about 160 seconds. A 12.5 meter parachute was deployed at this time, slowing the craft to about 70 m/s. The heat shield was released 20 seconds after parachute deployment, and the bridle, a 20 meter long braided Kevlar tether, deployed below the spacecraft. The lander separated from the backshell and slid down to the bottom of the bridle over about 25 seconds. At an altitude of about 1.6 km, the radar altimeter acquired the ground, and about 10 seconds before landing four air bags inflated in about 0.3 seconds forming a 5.2 meter diameter protective 'ball' around the lander. Four seconds later at an altitude of 98 m the three solid rockets, mounted in the backshell, fired to slow the descent, and about 2 seconds later the bridle was cut 21.5 m above the ground, releasing the airbag-encased lander. The lander dropped to the ground in 3.8 seconds and impacted at 16:56:55 UT (12:56:55 p.m. EDT) on 4 July 1997 at a velocity of 18 m/s - approximately 14 m/s vertical and 12 m/s horizontal - and bounced about 12 meters (40 feet) into the air, bouncing at least another 15 times and rolling before coming to rest approximately 2.5 minutes after impact and about 1 km from the initial impact site. After landing, the airbags deflated and were retracted. Pathfinder opened its three metallic triangular solar panels (petals) 87 minutes after landing. The lander first transmitted the engineering and atmospheric science data collected during entry and landing, the first signal being received at Earth at 18:34 UT (2:34 p.m. EDT). The imaging system obtained views of the rover and immediate surroundings and a panoramic view of the landing area and transmitted it to Earth at 23:30 UT. After some maneuvers to clear an airbag out of the way, ramps were deployed and the rover, stowed against one of the petals, rolled onto the surface on 6 July at about 05:40 UT (1:40 a.m. EDT). The bulk of the lander's task was to support the rover by imaging rover operations and relaying data from the rover to Earth. The lander was also equipped with a meteorology station. Over 2.5 meters of solar cells on the lander petals, in combination with rechargeable batteries, powered the lander. The lander on-board computer is based on 32-bit architecture with 4 million bytes of static random access memory and 64 million bytes of mass memory for storing images. The main lander components are held in a tetrahedral shaped unit in the center of the three petals, with three low-gain antennas extending from three corners of the box and a camera extending up from the center on a 0.8 meter high pop-up mast. Images were taken and experiments performed by the lander and rover until 27 September 1997 when communications were lost for unknown reasons. The 370 kg impactor component of NASA's Deep Impact probe collided with comet Tempel 1, as scheduled, in an experiment to gain more information about the make up of comets. The event was confirmed 7m26s later when the probe's transmissions reached Earth. The goals of the Deep Impact mission were to rendezvous with comet 9P/Tempel 1 and launch a projectile into the comet nucleus. This objective was achieved on 4 July 2005 at approximately 0545 GMT. Observations were made of the ejecta (much of which represented pristine material from the interior of the comet), the crater formation process, the resulting crater, and any outgassing from the nucleus, particularly the newly exposed surface. The scientific objectives of the mission were to: improve the knowledge of the physical characteristics of cometary nuclei and directly assess the interior of cometary nucleus; determine properties of the surface layers such as density, strength, porosity, and composition from the crater and its formation; study the relationship between the surface layers of a cometary nucleus and the possibly pristine materials of the interior by comparison of the interior of the crater with the surface before impact; and improve our understanding of the evolution of cometary nuclei, particularly their approach to dormancy, by comparing the interior and the surface. The project was selected as a Discovery class mission in July 1999. Deep Impact was launched on 12 January 2005 from Cape Canaveral, Florida, on a Delta II booster. The spacecraft transferred into a heliocentric orbit to rendezvous with comet P/Tempel 1 on 4 July 2005. Deep Impact was about 880,000 km from the comet on 3 July 2005, moving at 10.2 km/s relative to the comet, when the projectile was released and the flyby spacecraft executed a maneuver to slow down by 120 m/s and divert by 6 m/s. On 4 July, the impactor struck the sunlit side of the comet nucleus approximately 24 hours after release, at 0545 UT. At 10.2 km/s velocity, the impactor had an impact energy of about 19 gigajoules, and was expected to form a crater roughly 25 meters deep and 100 meters wide. (The estimate was based on models of comet structure and subject to large uncertainty.) Material from the nucleus were ejected into space, and the impactor and much of the ejecta vaporized. The flyby spacecraft was approximately 10,000 km away at the time of impact and began imaging 60 seconds earlier. At 600 seconds after impact, the spacecraft was about 4000 km from the nucleus and observations of the crater began and continued up to a range of about 700 km, about 50 seconds before closest approach. At this point (about 961 seconds after impact), imaging ended as the spacecraft reoriented itself by 45 degrees to optimize protection from dust damage as it flew by the nucleus. Closest approach to the nucleus was at a distance of about 500 km. At 1270 seconds, the crossing of the inner coma was complete and the spacecraft oriented itself to look back at the comet and begin imaging again. At 3000 seconds, the spacecraft began playback of data to Earth at 20 to 200 kilobits per second. The comet and spacecraft were about 0.89 AU from Earth and 1.5 AU from the Sun during the encounter. 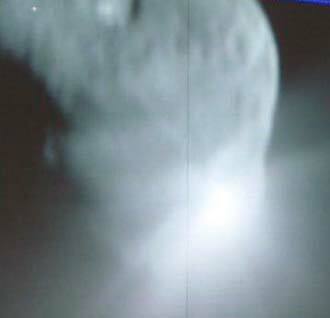 Selected impactor and flyby images and spectra were returned in real time to Earth during the encounter. Primary data was returned over the first day after encounter, with a 28 day supplemental data return period. Earth-based observatories also studied the impact. The spacecraft ranged over a distance of 0.93 to 1.56 AU from the Sun during the mission. The end of the mission was originally scheduled for August 2005, and a subsequent extended mission included another comet flyby and observations of planets around other stars that lasted from July 2007 to December 2010. After almost 9 years in space and the return of approximately 500,000 images of celestial objects, the project team at NASA's Jet Propulsion Laboratory in Pasadena, California, reluctantly pronounced the mission at an end on 20 September 2013 after being unable to communicate with the spacecraft for over a month. The last communication with the probe was Aug. 8. Deep Impact was history's most traveled comet research mission, going about 4.71 billion miles (7.58 billion kilometers). The Deep Impact spacecraft consisted of a 370 kg cylindrical copper impactor attached to a 650 kg flyby bus. The spacecraft was a box-shaped honeycomb aluminum framework with a flat rectangular Whipple debris shield mounted on one side to protect components during close approach to the comet. Body-mounted on the framework were one high- and one medium-resolution instrument, each consisting of an imaging camera and an infrared spectrometer, used to observe the ejected ice and dust. The medium resolution camera had a field of view (FOV) of 0.587 degrees and a resolution of 7 m/pixel at 700 km distance and was used for navigation and context images. The high resolution camera had a FOV of 0.118 degrees and a resolution of 1.4 m/pixel at 700 km. The infrared spectrometers covered the range from 1.05 to 4.8 micrometers with FOV of 0.29 degrees (hi-res) and 1.45 degrees (lo-res). The total flyby bus instrument payload had a mass of 90 kg and used an average of 92 W during encounter. The impactor projectile was made of primarily copper (49%) and 24% aluminum, so it would be easily identifiable in the observed collision debris, and minimize contamination in the spectra after the projectile was largely vaporized and mixed in with the comet ejecta on impact. The impactor was a short hexagonal cylinder built above the copper cratering mass with a small hydrazine propulsion system for targeting which could provide delta-V of 25 m/s. Targeting was accomplished using a high-precision star-tracker, auto-navigation algorithms, and the Impactor Targeting Sensor (ITS), a camera which provided images for autonomous control and targeting. The ITS was operated until impact, and images were sent back to Earth via the flyby spacecraft. The impactor was mechanically and electrically connected to the flyby spacecraft until 24 hours prior to encounter. After separation, it ran on internal battery power. Comet 9P/Tempel 1 is a periodic comet which orbits the Sun every 5.51 years. It has a semi-major axis of 3.12 astronomical units (AU, the distance from the Sun to the Earth) and a perihelion distance of 1.5 AU, between the orbits of Mars and Jupiter, in an orbit inclined 10.5 degrees to the ecliptic. The orbit has changed in the past, but its perihelion has been within 10 AU for at least 300,000 years. The nucleus is estimated to be roughly 14 km long and 4 km wide. Perihelion for the current orbit occured on 5 July 2005, the day after the encounter. The comet was discovered on 3 April 1867 by Ernst Wilhelm Leberecht Tempel, and was first recognized to be periodic in May of that year by C. Bruhns. NASA's Curiosity rover began a southwestward trek toward the lower layers of Mount Sharp, the main destination for the mission.